Salt is a great flavor enhancer and vitally necessary to our bodies if not taken in excess and I do recommend cooking with less salt than you think will be needed. One can add more to ones plate if wished. 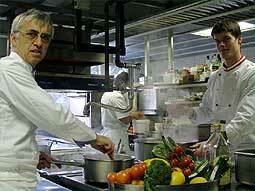 The French generally cook vegetables, soups and pastas in salty water. Cooking it this way helps the flavor of the salt to penetrate the food and greatly improves the taste(but be careful not to add too much). Adding salt to the water in which one is boiling food, raises the cooking temperature and will also give the vegetables much more intense color. I really recommend cooking with unrefined (gray) salt as it includes other minerals that are also needed by the body. Salt comes in two basic sizes, fine and coarse. Coarse salt is generally used for adding to water when boiling or adding to certain dishes at the end of the cooking process and fine is used for everything else. I really recommend against buying regular table salt or rock salt but only purchasing sea salt. Taste the difference for yourself and youll understand why! Since salt is relatively inexpensive, this luxury is a great investment in terms of improved taste. I really like to vary the way my dishes are flavored and why I suggest using all the substitutes possible. Examples would be: a raw vegetable salad served with anchovies, freshly ground pepper and olive oil. You could also add a little red wine vinegar or lemon juice to the above dressing. Another example of adding a substitute would be slivers of Parmesan or grated Parmesan over a dish instead of salt. Personally, I like something that is not French at all! This is Thai fish sauce added as a flavoring to a dish. You can buy this in a supermarket or Asian store. This sauce is extremely versatile and can be used in many dishes instead of salt. Beware of the hidden salt in most prepared foods, like canned goods, sausages, hams etc. and dont then make the mistake of adding too much salt yourself.